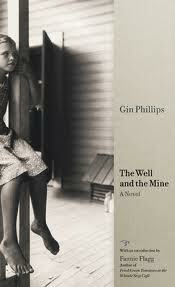 The Well and the Mine by Gin Phillips, New York: Riverhead Books, 2007, 290 pp. Following on the heels of The Funeral Dress, I guess I’ve just been in the mood for fiction of life in Appalachian coal mining towns. I wanted more of that spirit. While The Well and the Mine takes place in Alabama in the 1931, the scene and characters bare a strong resemblance and I enjoyed this book a great deal. The Well and the Mine is the story of the Moore family. Father Albert works in the mine, mother Leta tends the home. Daughter Virgie is entering her teen years, daughter Tess is in the heart of her childhood, and brother Jack is the youngest. Each character takes turns at the narration, a technique accomplished with a short section break and a tiny, italicized indication of the new name in the indent of the new paragraph. At first, this felt convoluted and unnecessary, but it smoothed out once I became familiar with the characters, their voices and concerns. By the end, I appreciated the multiple perspectives. The core mystery of the story is what happened at the Moore’s home on a summer night, when Tess witnessed a woman throwing a baby down the family’s well. The family and the town are horrified, and the story follows Virgie and Tess as they conduct their own investigation. Their inquiries and discoveries open their eyes to the struggles of those around them. While they are poor by any modern standards, their family’s small plot of land place them in a much more stable, well-fed position than many of their neighbors. Virgie and Tess move from anger and horror at the baby in the well to compassion and empathy for the woman who finds herself in such terrible circumstances. However, what drives the book is not the plot, but the evocation of the characters and setting. As Fannie Flagg says in her blurb on the back, this book “gives you a whole world.” Phillips invites readers to a 1931 coal mining town. She describes the daily grind inside the coal mine, and what it does to Albert’s strong body. She gives an intricate tour of the family’s simple home, complete with the outhouse and animal dwellings in the yard. She contrasts their home with the homes of sharecroppers and African-Americans and company-owned houses. She reveals the smallness of that world, when the family goes to Birmingham, and the way segregation impacts relationships. The reader gets to see this world through the eyes of the characters, for whom it is everyday and ordinary. I think what I enjoyed most about this book was the fact that the characters are simply good people in tough circumstances. There are no evil enemies, just a collection of circumstances and people coming together as a community to manage them. Some are more privileged than others, but no one is living well. Their only hope of survival is treating one another with some measure of kindness, compassion and mutuality–even when someone does something as disturbing as throw a baby in a well. 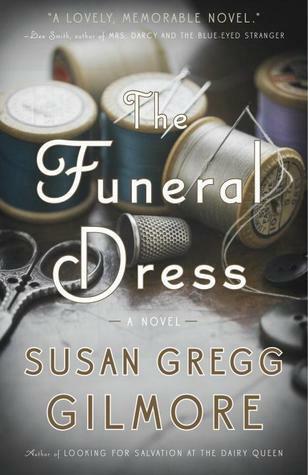 The Funeral Dress, by Susan Gregg Gilmore, Broadway Books, New York, 2013, 356 pp. A good story with good characters that moves quickly and leaves me feeling good is like eating candy for me. I just keep unwrapping one chapter after another, without counting pages or calories or being concerned in the least about whether it’s good for me. One bite after another until it’s all gone. That’s what reading The Funeral Dress has been like for me–sweet and tasty and pleasurable, without any concern for profound questions. It’s escape fiction, with a feel-good spirit. The Funeral Dress tells the story of Emmalee Bullard, a young woman with a brand-new baby who has never known a mother’s love herself. Just when she finally has an opportunity to escape her hard life and find someone who will care for her and her child, everything is taken away. Leona Lane is her co-worker at the sewing factory, but she and her husband Curtis die in a car accident the day before she is to pick up Emmalee and the baby. Emmalee responds by stepping up to make Leona a funeral dress, which draws the ire of the town and the attention of a variety of people interested in her life and her baby’s welfare. Some are genuinely caring and concerned, others are simply in it for themselves. The Funeral Dress unfolds the story of the days between Leona and Curtis’ death and funeral, with flashbacks that tell the story of Emmalee’s childhood, love and pregnancy, with flashbacks to Leona and Curtis’ own ups and downs in marriage. The novel contained some of my favorite story elements–a woman living in hard circumstances finding her own way, the power of relationships between women, the twists and turns of changing relationships caused by her new outspokenness, and a sense of hope and encouragement without a fairy tale ending. The Funeral Dress was a good story well told, a fast read, and a fun escape. 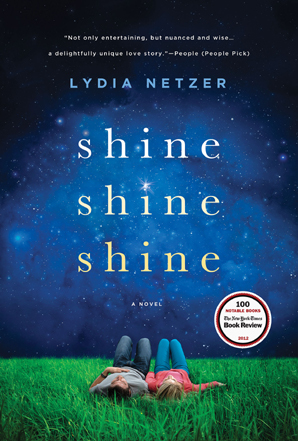 Shine, Shine, Shine by Lydia Netzer, New York: St. Martin’s Griffin, 312 pp. This book was marketed to book groups (especially women’s), which usually indicates to me an interesting story that raises some topics for conversation. Its cover indicates it was one of the New York Times’ Review of Books 100 Notable Books in 2012, which means I can trust the quality of the writing. Both things were true, although I found the novel a bit slow. It was good and entertaining, but not especially compelling or memorable or moving. Shine, Shine, Shine tells the story of two misfits who find each other as children, fall in love, and start a family of their own. Maxon is a boy abused in his rural upbringing, showing symptoms of autism or Asperger’s syndrome in his difficulty understanding emotions, and a genius in robotics headed on a mission to the moon. Sunny is the daughter of a missionary in Burma who returns to the United States, and bald from the day she is born. They have a son, Bubber, and a daughter on the way. The book traces their unique relationship with one another, the way they love and understand and protect one another from a world that was not made to understand them. It examines their individual histories and the development of their relationship, until a critical life-or-death moment they must face separately, yet in a connected way. While I did enjoy the story, I think the reason it did not hook my interest more deeply is because Sunny and Maxon were neither normal enough or different enough to be compelling. Their oddities were not so odd as to render me curious to see the world through their eyes or navigate it through their bodies. Their level of normalcy was not deep and poignant enough to make me want to associate my life with theirs. I think the main reason I kept reading was because the book was set in Norfolk, Virginia, which is my home territory. Netzer spoke to familiar sites and places, although she did not speak of them as a native would have (she is a transplant to the area herself). Shine Shine Shine was a decent story, solid writing, decent characters, but nothing sensational. Good entertainment and distraction for a little while. I’d recommend it for the beach or for a plane. 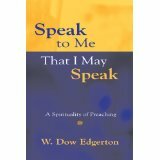 Speak to Me That I May Speak: A Spirituality of Preaching by W. Dow Edgerton, Pilgrim Press, 2006, 205 pp. I’ve been contemplating the ways in which my life as a preacher impacts my personal walk with God. Preaching demands each and every week that I set aside time to have a meaningful encounter with God through a particular scriptural text, and to think about how God is speaking through that text to the lives of the people in this time and place. It is a spirituality, a discipline, a holy walk. It was these contemplations that finally made this the right book at the right time, even though I’ve owned it since 2011. Speak to Me That I May Speak was not what I expected at all. I expected something similar to what I wrote above–an account of the ways in which the work of preaching shapes the preacher’s own spiritual life, along with some techniques or disciplines that can engage that spiritual work more deeply. I anticipated stories from Edgerton’s own experience, mixed with reflection and straightforward suggestions for the spiritual development for all of us who live the preaching life. Instead, what I discovered is hard to describe. The image in my mind is of Dumbledore standing over the Pensieve, a magical tool for storing one’s memories. When he stands before the Pensieve, wand in hand, the memories come like long threads of a cloudy, stringy, vapors into this holy vessel. The memories can then be stored and viewed in third person, as though one is watching things happen. This offers the opportunity to stand back and reflect, even if it is on your own life–all within the wispy cloud of things remembered. Edgerton’s use of the second person throughout the book makes it feel as though you are watching yourself, or watching someone else. His writing style is like spinning out vapors, laying out clouds of words which come together to make you see a picture, but dimly–and yet somehow that is what makes it beautiful. There is great depth of analysis and interpretation of every ingredient behind the preacher’s task. Rather than describing it as a spirituality of preaching, Edgerton’s book is more like a phenomenology, a rendering of the phenomenon of creating a sermonic event. He covers the areas of scriptural study, study of one’s own context and community, encounters with the Holy, the power of language to create worlds, and interpretation between preacher and congregation, all with an eye toward what really transpires in the sermon and its preparation. The chapter on “Scripture as Scripture” was the most practically helpful to me, although that is not a judgment on the value of the rest of the book. Edgerton identifies the genres of speech in the Bible (i.e., parables, narrative, laws and commandments) as different ways of knowing and kinds of knowing. For example, parables are knowing by subverting expectations. Laws and commandments are knowing by doing. Narratives are knowing by story. Especially powerful was his section on the Psalms, which he observes addresses not just everyone, but each one. This has always been my experience of the Psalms–that they give voice to my inner self, and consequently enable me to stand before God, revealed. This is also why I use the word phenomenology for Edgerton’s work–he describes how the Psalms are experienced in the journey of faith. Reading this book sometimes felt like staring at an ink blot–it didn’t reveal nearly as much about Edgerton’s thoughts and conclusions as it did my own. Yet, as you can see above, his writing is rich and provocative. My preferred style is much more straightforward and clarifying, but I enjoyed this excursion. 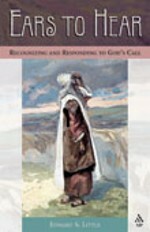 Ears to Hear: Recognizing and Responding to God’s Call, Edward S. Little, Morehouse Publishing, Harrisburg, PA, 2003, 154 pp. As I have written here before, I can’t resist a good looking book about God’s call. It’s one of those topics that I spend a lot of time contemplating, and I am always hungry for new perspectives. According to a note on the title page, I purchased this one back in 2006, and it has been resting on my “to-be-read” shelf until it called out to me just a few weeks ago. It was just what I needed right now. Little’s approach to the topic of call is through a scriptural study of various call stories in the Hebrew Bible. I appreciated Little’s opening definition of call, which immediately expands not only beyond ordained ministry, but beyond individuals and beyond roles within the church. The book contains sixteen chapters, each a case study of a biblical call story. Little covers the typical stories of Abraham, Moses, Samuel and Isaiah, but reaches far beyond them to more obscure figures like Hosea, Amos, Zerubbabel, and even Bezalel and Oholiab. From each, Little draws observations and conclusions about how God’s call works in different kinds of circumstances. While some of his bullet points were a bit too pithy for me, the analysis and perspective he reads into the various stories moved me. The same thing applied to his naming of “fade out” in Zerubbabel’s story as “when the tyranny of immediate concerns places God’s call on the back burner.” (138) Those were exactly the concerns in my own spirit that prompted me to pull this one off the shelf, and his words were a gift. I can imagine other times in my life when I would respond more powerfully to other chapters and other stories.